The outrageous antics of ten of Louisiana's high-profile legal celebrities on both sides of the courtroom are the focus of this fascinating book. Editor S. L. Alexander brings together communications and legal experts Jennifer John Block, Erin Bremer, Lyn Koppel, Glenn Watts, and Charles Zewe to delve into the legal foibles and follies that plague Louisiana's legal system. After an introduction to the intricacies of Louisiana's courtroom customs, each chapter provides a concise history of a colorful personality from former four-term governor and convicted felon Edwin Edwards's outlandish antics to wealthy entrepreneur Chicken King Al Copeland's many peccadilloes. Included are characters from both sides of the law such as TV reporter Richard Angelico; Jefferson Parish Sheriff Harry Lee, known as the Chinese Cowboy; DA Harry Connick Sr., known as much for his singing as his courtroom performances; and many more. 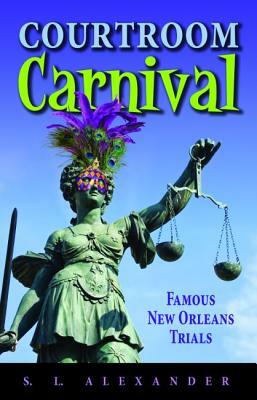 Courtroom Carnival: Famous New Orleans Trials presents a fascinating and educational read from the overview of what makes the courtrooms of Louisiana so unique to the expos 1/2s of the bizarre characters on both sides of the bench.